Johann is just a young boy of 11 when Hugo, a master court painter, spots his talent. A small innkeeper’s son sketching and painting are his only pleasures in life and Huge believe he can go far through them. Taking Johann on as an apprentice, Hugo gives him the knowledge and skills he needs to take his place at the guild as a master painter when he is a man. But what neither of them realise is that there’s something more to Johann’s work… his abilities stretch further than just being able to paint a person, he can possibly change their lives. When I saw the summary of this book I thought it sounded really interesting. I like book that feature art as a major subject even though I’m not in any way artistic myself! The Court Painters Apprentice seemed like a fun, historic, artsy book that I could just pick up quickly one day, and it was… but it was also so much more than that too. I loved the storyline, the young apprentice grows into a man in front of your eyes and learns so much about himself, life and his abilities. He has the abilities to alter people’s lives through his work, which is a huge part of the story and is given away in the summary but it doesn’t actually matter cos this book is about the outcomes of that, where that gets him and the writing is brilliant due to what the book reveals itself to be. I don’t want to give too much away but I will say that reading this reminded me a lot of Chris Priestley’s work, the description and the feel of the story was brilliant. My only downside was that it was a bit difficult to get into, the first around 60 pages were slow for me, which isn’t brilliant as my copy only actually had 172 pages! But I could tell that this one was going somewhere, somewhere good so I wanted to carry on! The characters are lovely and wonderful and exactly what youd expect from a middle grade book. You had the shy girl, the parental figures and the extremely likeable main character but you also get some baddies and some points which make you question characters motives and things like that. I really would recommend this to any 10+ kid, especially one who appreciates art and painting. The only reason I wouldn’t go younger with my recommendation is because later in the book Johann is around 17, as far as I could work out, and goes drinking in taverns… not that he gets drunk or anything but still! 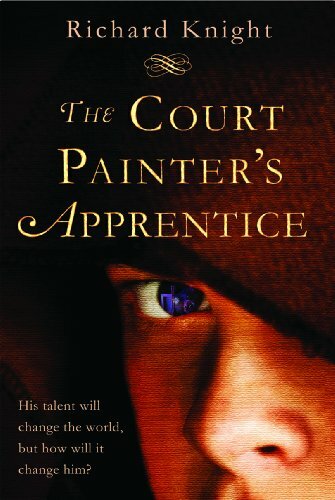 The Court Painters Apprentice is Richard Knight’s second MG novel. It will be released on January 1st by Catnip Publishing. Thank you to the publisher for sending me the book in exchange for an honest review!